Okay, before checking out for the Thanksgiving holiday, it may a good idea to check in on the US stock market’s trends around everyone’s favorite Thursday. 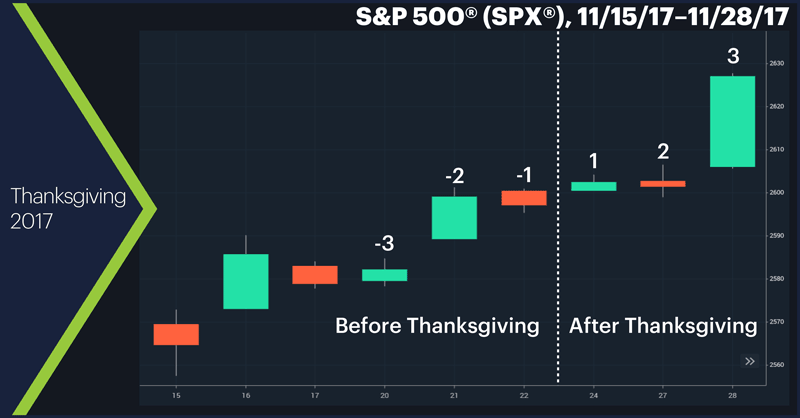 For the past half-century or so, the S&P 500 (SPX) has often followed a fairly unique pattern around the Thanksgiving market holiday. 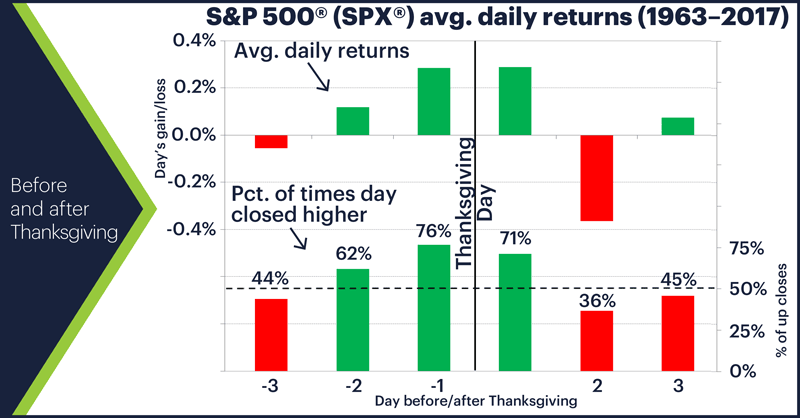 The turkey takeaway: The market has, more often than not, closed higher the day before and after Thanksgiving, and closed lower the following Monday. And there are a couple of other interesting side dishes. The following chart shows the SPX’s average performance in the three days before and after Thanksgiving in the 55 years from 1963-2017. The top half of the chart shows each day’s average return, while the bottom half shows the percentage of times each of these days closed higher. Yesterday (the third day before Thanksgiving) fit the general pattern by closing lower. If the historical averages continue to play out this year, the implication is that today and tomorrow would have better than average odds of closing higher. But overall, the first two days after Thanksgiving may be the most interesting. The Friday following the holiday had the highest average gain (0.29%) and second-highest percentage of up closes (71%), despite being a shortened trading session. The Monday after Thanksgiving, though, has been the weakest of the three days before and after the holiday, closing higher in only 20 of 55 years (36% of the time) with a -0.37% average return—a somewhat cheerless start to the first full week of the holiday season. The third day after the holiday was a mixed bag: It had a positive average return but closed up only 45% of the time—which suggests that when the SPX did close up on this day, it was with a larger-than-average gain (as was the case last year, coincidentally). ●The SPX closed up on the Wednesday before Thanksgiving in 42 of 55 years (76% of the time). ●The SPX closed up the Friday after Thanksgiving in 39 years (71% of the time). ●The SPX closed down the following Monday in 35 years (64%) of the time. If these percentages don’t sound unusual to you, remember that slightly less than 53% of days from November 1963 to November 2017 closed up. Finally, remember that every year is different. Last year, for example, the SPX broke with the pattern by closing lower the day before Thanksgiving, but then it got back into sync and closed up the day after the holiday and closed down the following Monday. And the final bar on the chart is the third day after Thanksgiving—a 1% up day. Market Mover Update: Yesterday crude oil futures dropped to their lowest level since last Tuesday’s -6% implosion, but quickly rebounded to get back to breakeven on the day. After dropping more than 3% to $55.28 in the morning, January crude futures (CLF9) had rallied back into the black—and above $57— in the afternoon. Today’s numbers: Housing Starts (8:30 am ET). Today’s earnings: Analog Devices (ADI), Best Buy (BBY), Campbell Soup (CPB), Copart (CPRT), Dollar Tree (DLTR), Hormel Foods (HRL), Kohl's (KSS), Lowe's (LOW), Medtronic (MDT), Ross Stores (ROST), Target (TGT), TJX (TJX).